Yesterday we had a new roof put on the house. Remember that hail storm we had in early March? Well, the insurance company agreed to pay for the bulk of it, so might as well. I just hope we don’t have to deal with another one for a LONG time! The roofer called us on Tuesday night to tell us the guys would be here at 8 o’clock Wednesday. Early, but doable. They showed up at 7:15, before I was even finished getting dressed! Ducky started freaking out, Shadow started attaching herself to my leg, and the dog-daddy woke up pi**ed off. I had to get Ducky’s breakfast prepared and back in the can and ready to take to daycare with us. I had to put her on her leash just for her first potty break. I was not happy. Anyway, after finishing my bathroom routine, I took Ducky and her breakfast down to daycare. She, at least had a good day. When I got home, I sent the dog-daddy to Chick-Fil-A for some take-out breakfast and tried to feed Shadow. She wouldn’t touch even one morsel, poor old girl. Can’t say as I blame her. All the pounding overhead was giving me a headache. When hubby got home with our breakfast, we all sat down in the living room and tried to eat. 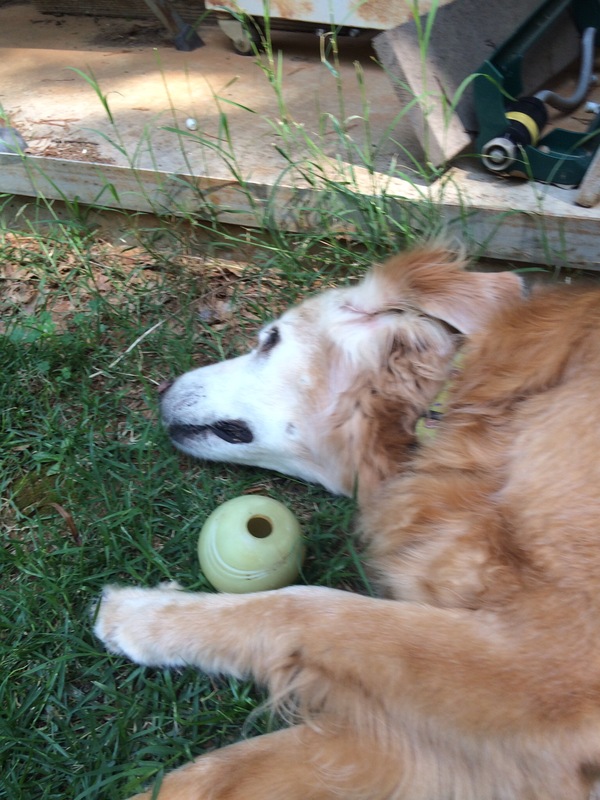 After that, I decided the only way Shadow was going to relax was to play out in the yard. So, we spent the rest of the morning enjoying “Mom and Me” time. Playing ball, keep-away, and chase; and taking selfies and other pix. Here are some of them…. I just received my grade for my third test: 99%! This is “cool” stuff! It’s not as gut-wrenching as I half-expected. It’s actually pretty interesting. And, while it may not be everyone’s proverbial cup of tea, I’m finding it helpful in my quest to not be quite so paranoid about every little thing that befalls my pups – especially Shadow. And, it’s helping me realize that hubby and I really did do everything we possibly could for Callie, and Kissy, at the end of their time here on earth. It has also given me a new appreciation for the folks who work for our vet. Their job is not an easy one – I was never under the illusion that it was – but the veterinary assistant’s job is multifaceted and stressful, just as are the vet tech’s and vet’s jobs. We’ve been inside most of the morning – eating breakfast, having to listen to the news and the dog-daddy cussing at the TV, and me working on my test answers for Stage 2 of my Vet Assistant course. Oh! I didn’t tell you yet! I got a 95% on my Stage 1 exam. Proud of myself? Hell Yes!! Anyway, I have more work to do this afternoon on my upcoming test, so decided to get some fresh air first. And Ducky’s been in brat mode this morning. Hopefully the fresh air will settle her down a bit. It’s chilly out here, like Spring should be! 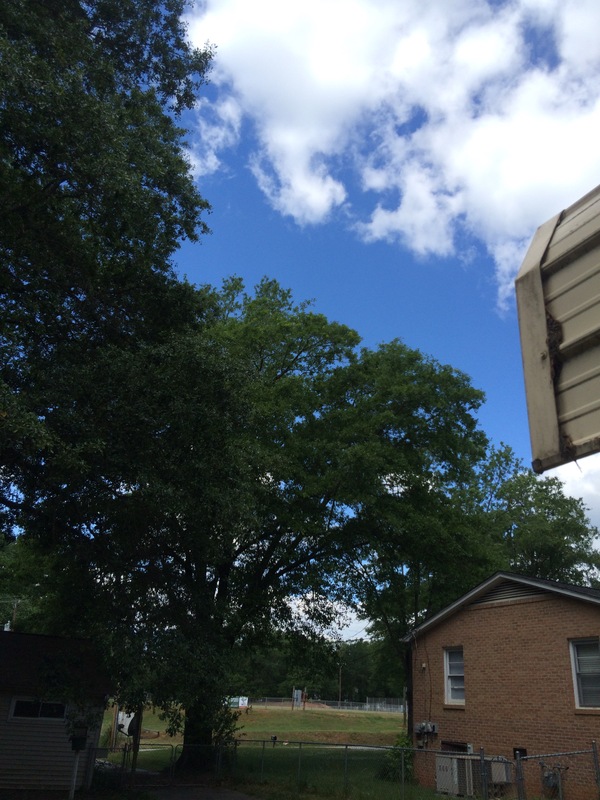 Temps are in the high 50s/low 60s, there’s a strong breeze (more like a “wind”), and the sun is playing peek-a-boo with the puffy, white clouds and gorgeous blue sky. To think that this time last week I was wearing shorts and short-sleeve t-shirts and spending late afternoons in the air-conditioned house. Crazy weather! Tomorrow is Shadow’s re-check appointment with Dr. Steve. Hopefully he’ll say the toe sprain has healed enough to be able to lift her playtime restrictions. We both miss our favorite game. And Ducky will be at daycare for a few hours. We hope y’all will have a great day!! Best Part Is No Bugs! 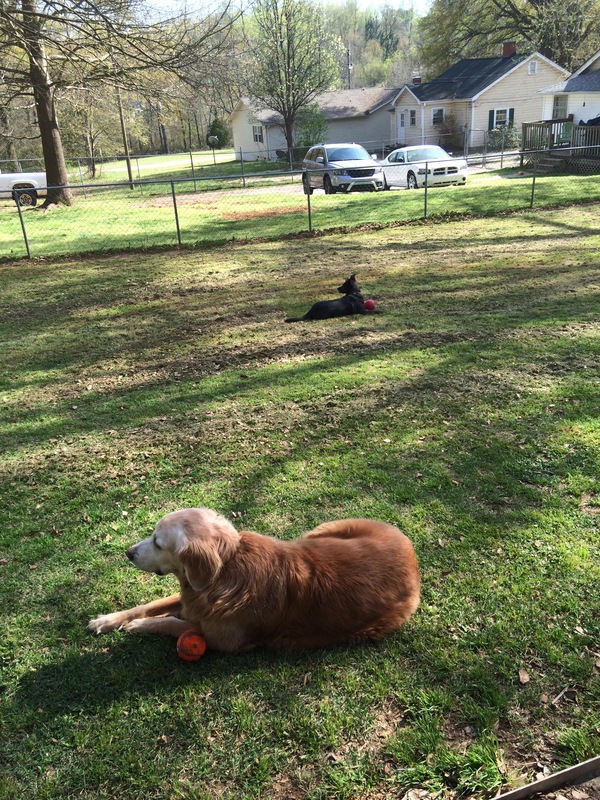 Spring here in Taylors, SC, is great – when it’s not raining – the girls and I can relax in the backyard. The temperatures are in the low 70s (today at least) AND the warmest part of the day is right around 4 pm. And the best part is there are NO BUGS yet! There are a few bumble bees here and there; but the yellow jackets, noseeums, and fire ants are still hibernating in their underground homes. 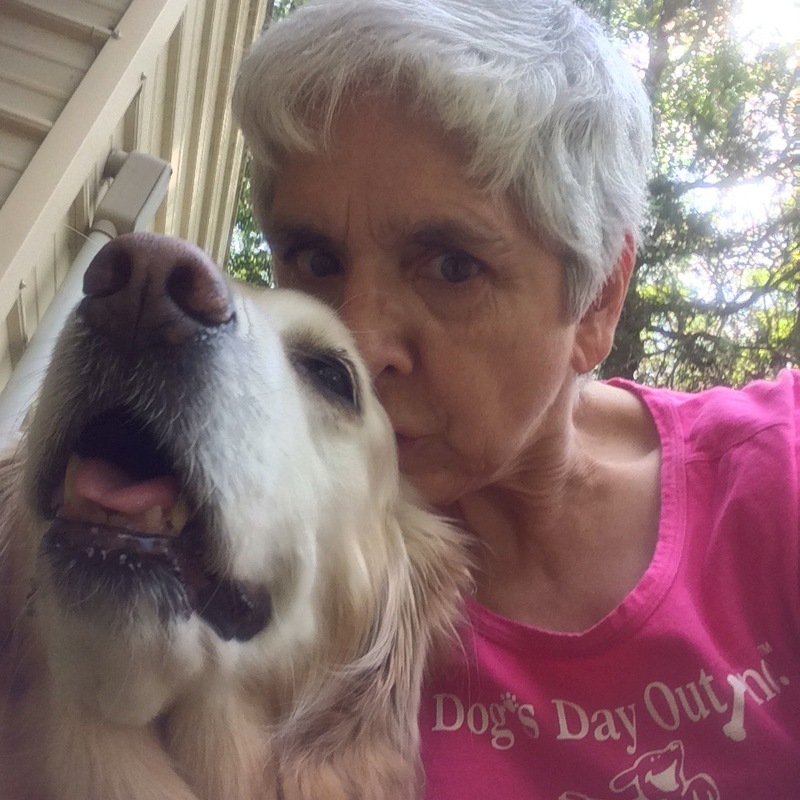 Thanks to our Thursday Barks and Bytes blog hop hosts, Jodi of Heart Like A Dog and Linda of 2 Brown Dawgs! See the links below for more great blogs. 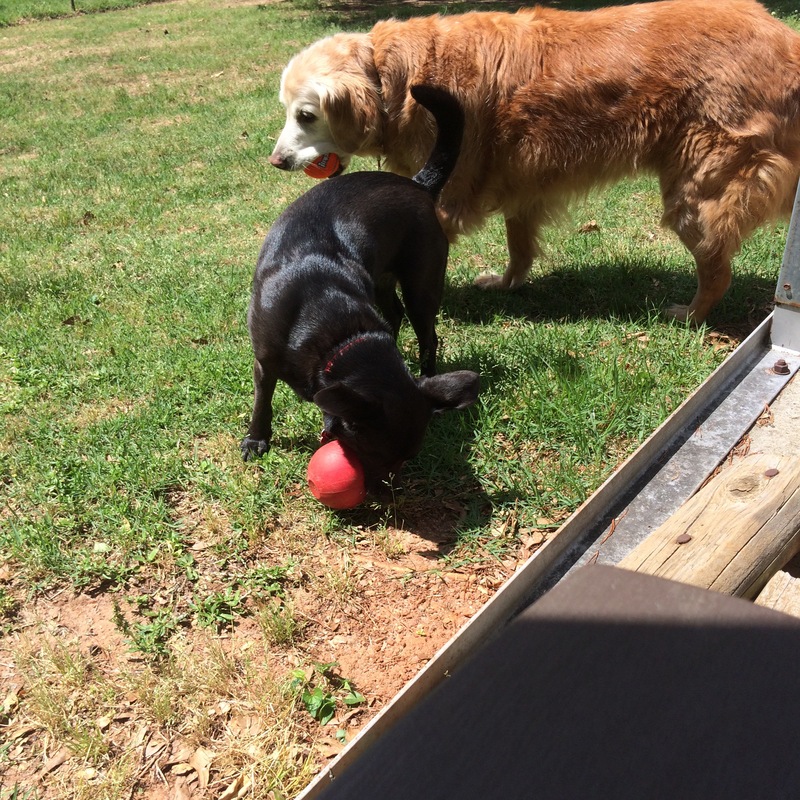 And for Shadow, Ducky, and me, normal is spending sunny days out in the back yard. Hubby prefers to spend his days watching the news or reading while music is playing so loud that it gives me a headache. I’ll leave the rest to your imagination. Not much was normal around here while my brother was visiting. Ducky was stressed out because there was a “stranger” in her house. And Shadow was stressed out because Ducky was stressed out. 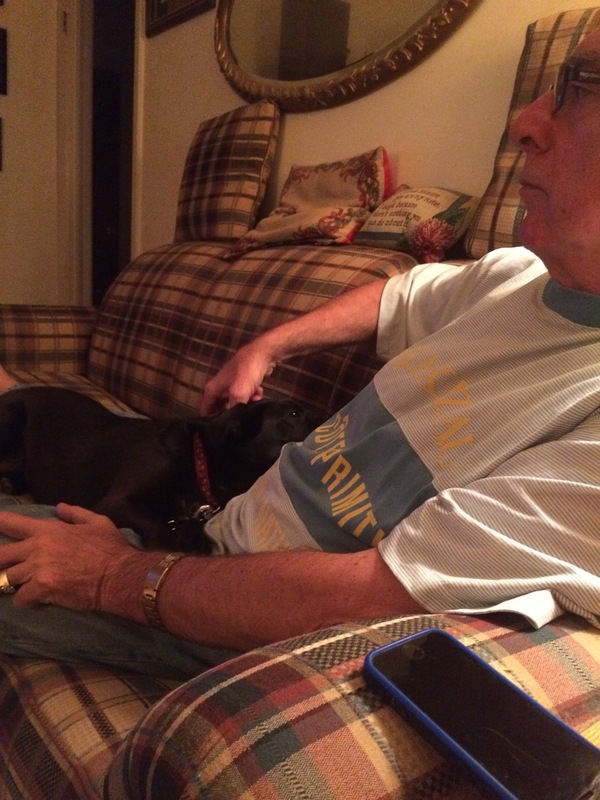 Daycare was a blessing for Ducky – it gave her several hours during six of the seven days her Uncle Doug was here to relax and play with her doggie friends. And it was a blessing for Shadow and us uprights. The rest of the time she was fine as long as Doug was sitting quietly somewhere in the house. But I had to keep her on her leash except when she was in her crate. On the way home from daycare the night before Doug was going back home, we had a terrifying hail storm during the last mile plus of our ride home. The hail was smaller than a quarter, but it was coming down fast and furious. And there was no place to pull over. I had no choice but to keep going. So I kept going. About five miles an hour with about ten car lengths between me and the car in front of me. And behind me. Ducky hunkered down in the back seat and curled up into a little black ball. We pulled into the driveway; and as I turned off the engine, I looked up at the sky and thanked God and the universe for getting us home safely. I coaxed Ducky into my lap and we sat there – both of us shaking – until the hail stopped. Hubby opened the front door and I carried Ducky into the house. My insides finally stopped shaking a few days later. Ducky is finally past her uncertainty about the car. Anyway, around the house things are back to normal. Ducky is our little “wild child” again. And Shadow is back to eating her normal amount of food. And, as long as it’s not too cold and windy, the girls and I spend our days in the yard. Thankfully, Spring has sprung around here. Thanks to our hosts of the Thursday Barks and Bytes Blog Hop, Jodi of Heart Like A Dog and Linda of 2 Brown Dawgs! So this is what happens when I forget to lean the gate back against the bedroom doorway. Surprise. Ducky didn’t get snarky with Shadow when she walked past the crate. Or if she did, it didn’t bother Shadow like it normally does. 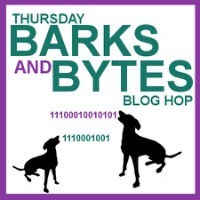 Welcome to the Thursday Barks and Bytes Blog Hop hosted by 2 Brown Dawgs and Heart Like A Dog. For more fun, check out the links! 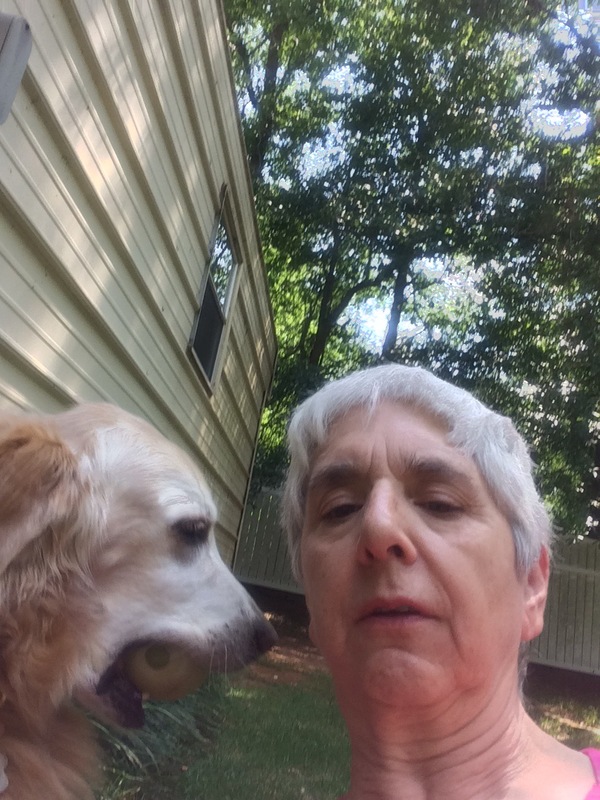 Those of you who have been following my original blog, My Golden Life, for a while might remember that I completed my Dog Obedience Training Instructor course through the Animal Behavior College in May of 2012. It was because of the externship phase of that course that Ducky and I found each other. It is what it is. Well, since completing the training course, I’ve also completed five of the school’s Continuing Ed courses. The first two I completed in late 2012/early 2013. Then I took an extended break before starting the third course. 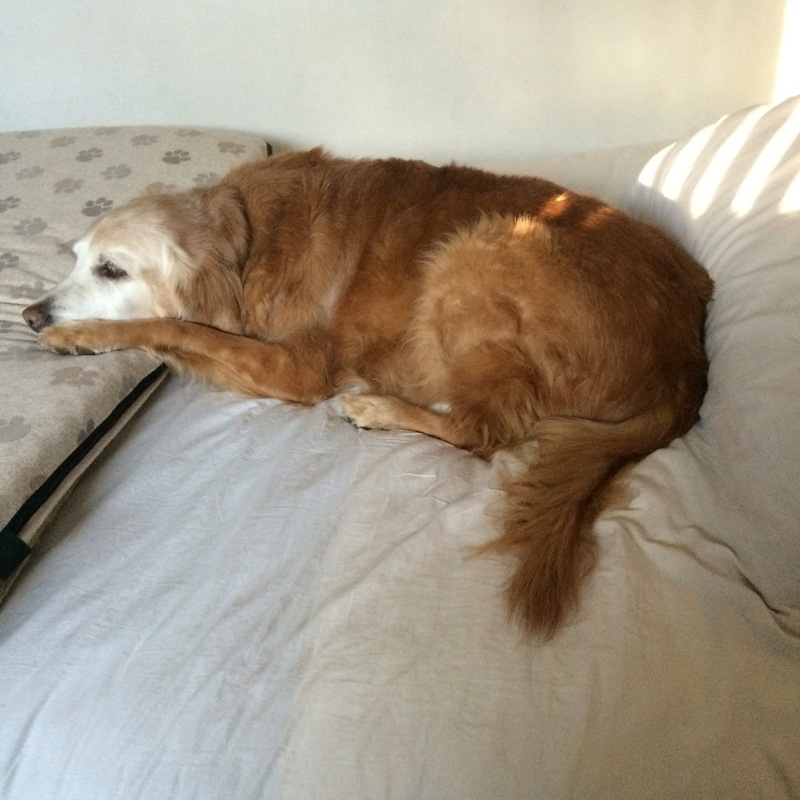 I started the Pet Nutrition and Diet course just before we found out Callie had lymphoma. I tried to stick with it that first week of August but just couldn’t. 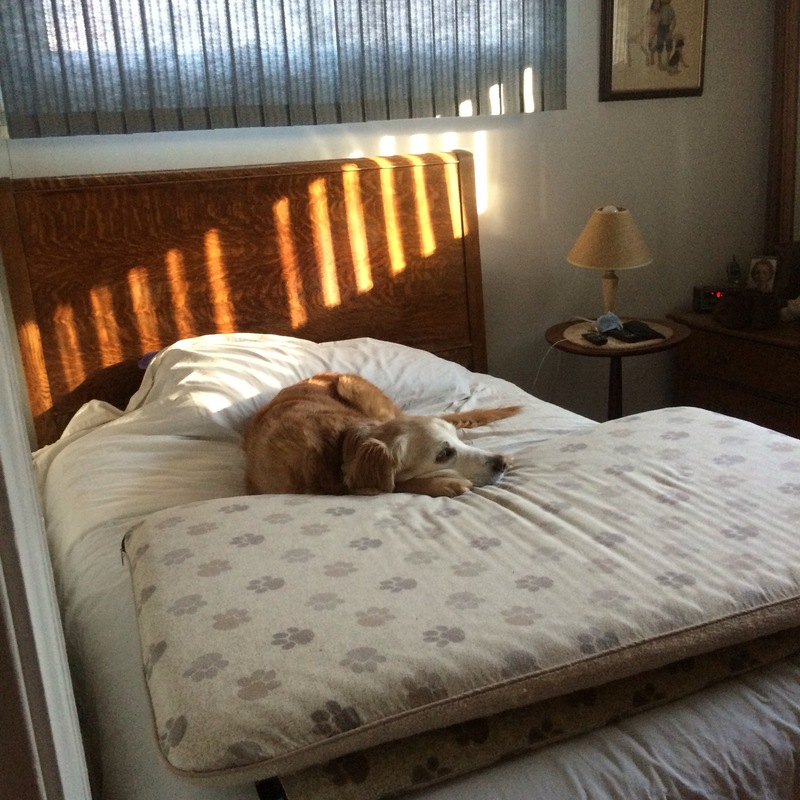 Callie’s health and well-being occupied all my time, energy, and thought processes. So I got another extension to the beginning of January 2016. When I realized I was close to the exam due date, I called my program manager and got her to give me a two-week extension. I explained about Callie and how 2015 had been “the year from hell”. Well, the course was really intense but I got through it and passed the exam with a grade of 80%. Not bad considering I hated science and math in school. Recently I finished the Pet Massage (really, it should be called Canine Massage) and Pet CPR and First Aid courses, with grades of 97% and 100% respectively. I wish I had taken these two courses first, while Callie was alive and well, so I could have helped her more through her illness; but it is what it is. At least the massage course taught me how to help Shadow when her arthritis is bothering her. And I have a manual to go by if either Shadow or Ducky should need first aid. In a couple of months I hope to be starting the Vet Assistant course. I don’t regret waiting to take this course. If I’d taken it first I may have never found Ducky. 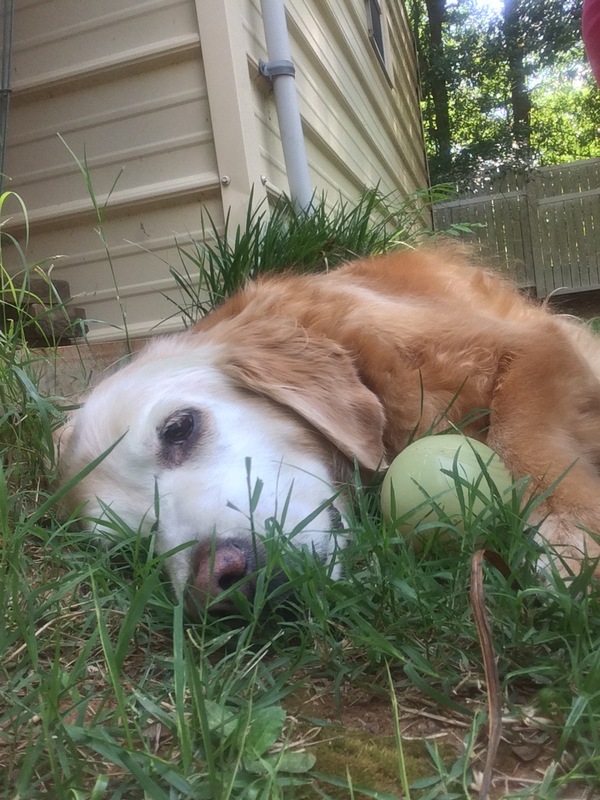 And, as insidious as cancer is, there’s no guarantee I’d have recognized the signs of Callie’s illness before her annual exam in early August. I just want to have the knowledge so I can better help Shadow and Ducky if the need ever arises. 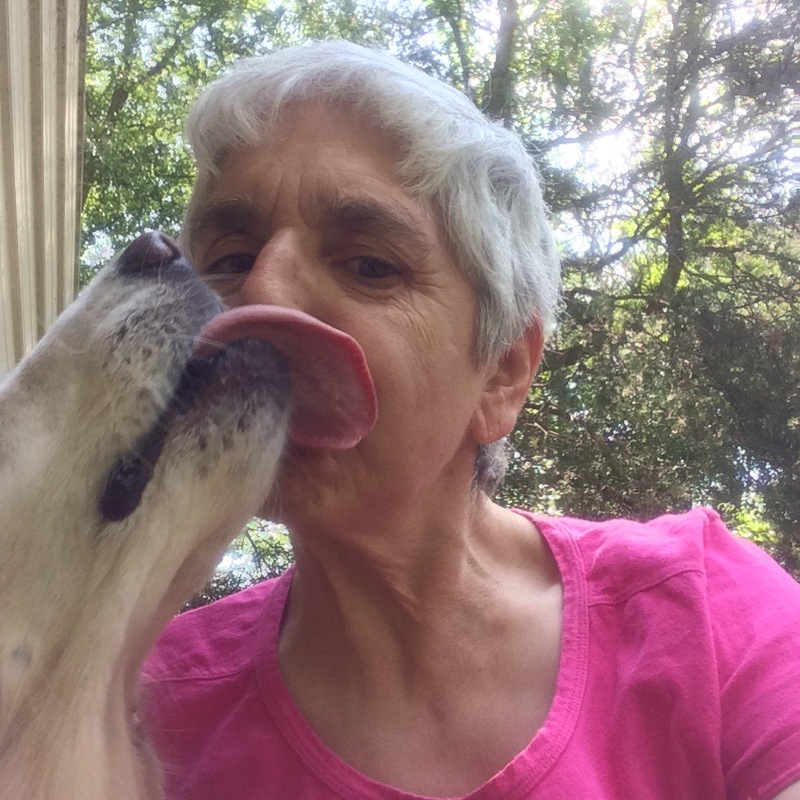 Okay, so now that I’m done tooting my own horn, I’d like to thank Jodi of Heart Like A Dog and Linda of 2 Brown Dawgs for hosting the Thursday Barks and Bytes blog hop.